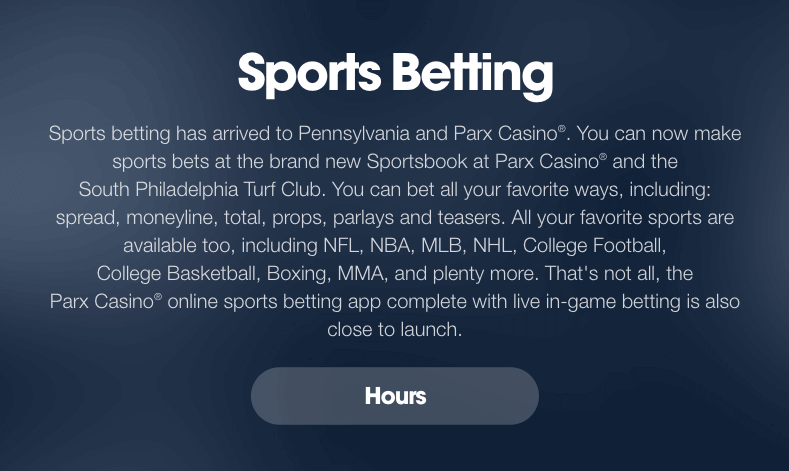 Parx Sportsbook Review April 2019 | Mobile betting coming soon to PA! At the new Parx Casino Sportsbook, sports betting in PA has never been easier. Parx Sportsbook enjoyed a soft launch on January 8th and an official opening on January 10th. With our Parx Sportsbook review, you can learn all about the betting markets covered, available banking options, and customer support. Furthermore, get info on Parx Sportsbook app that will be available soon. The table below offers some details about the sportsbook as well as bonus offers for betting and casino gambling. Our Parx Sportsbook review quickly found that Parx Sportsbook is not offering a welcome bonus currently. However, it’s likely they’ll offer a bonus in the future, but since this is a new betting site, there is no current off on hand. Likely, it will be released in connection with their mobile app. In addition, there are no real money bonuses for the Parx Philadelphia casino that can be redeemed. Unfortunately, the lack of bonuses or ongoing offers is a disappointment. However, you can expect Parx Casino Sportsbook to present these soon. At Parx Philadelphia, you will enjoy a thrilling experience with many forms of betting. This Philadelphia casino offers hundreds of slots along with table and card game selections. If you are looking for sports betting thrills, the Parx Casino Sportsbook section has just been added, providing you with a great way to engage in legal sports betting in PA.
Gambling is quite popular in PA and with the Parx Casino Sportsbook, you can enjoy amazing casino action at any time. Not only can you access the land casino, but you can also play casino games online from home. With this Parx Casino Sportsbook review, you can learn about all of the types of casino games that are offered, each presenting amazing chances to generate payouts. Slot Games: At Parx Philadelphia, you will find amazing slot selections. There are the classic three reel games if you prefer a traditional experience. There are also some great video slots with five or more reels and multiple paylines. The land casino offers more than 3,300 slot games and the online casino offers hundreds of great titles as well. You will also be able to enjoy gambling on the go with the mobile platform for this Philadelphia casino. Some of the great slot titles found at Parx Philadelphia include China Shores, Ancient Dragon, Carnival in Rio, Flowers, and Jack Hammer. Table and Card Games: Looking for the thrills of table and card games? At Parx Casino, you can enjoy the action of blackjack, poker, roulette, and more. The online site offers three versions of blackjack, a European Roulette version, Hi-Lo Solitaire and a number of other titles. At the Philadelphia casino location, you will find over 130 table games available along with a poker room with 80 tables. Video Poker: Video poker is a great game that offers some of the best odds of winning. With multiple variations, you can find endless video poker action. This Parx Casino Sportsbook review reveals multiple titles that can include Double Bonus Poker, Cash Draw Poker, Jacks or Better, Regal Poker, Destiny Poker, and many others. Parx sports betting is finally available. You can visit the Parx Casino Sportsbook to start placing wagers on many types of sports. At this time, there has only been a soft launch of the online sportsbook, but the complete Parx Casino Sportsbook will be up and running online soon. 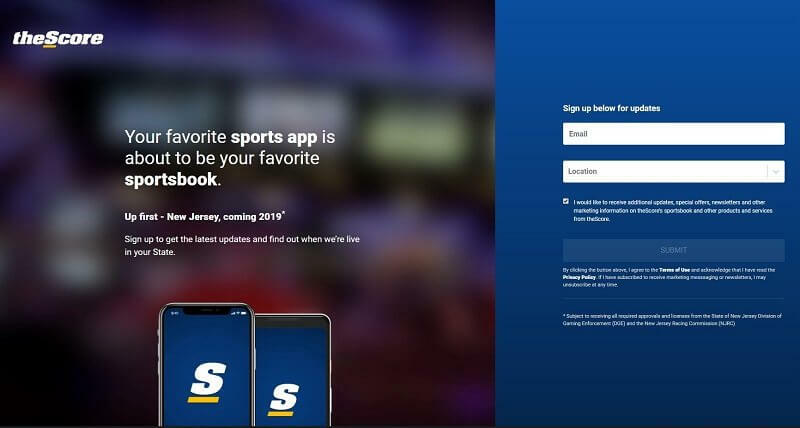 The Parx Sportsbook will also soon be offering a mobile platform. When it comes to Parx sports betting options, you will find all major sports being covered. This includes the NFL, NBA, MLB, NHL, College Football, College Basketball, MMA, Boxing, and more. 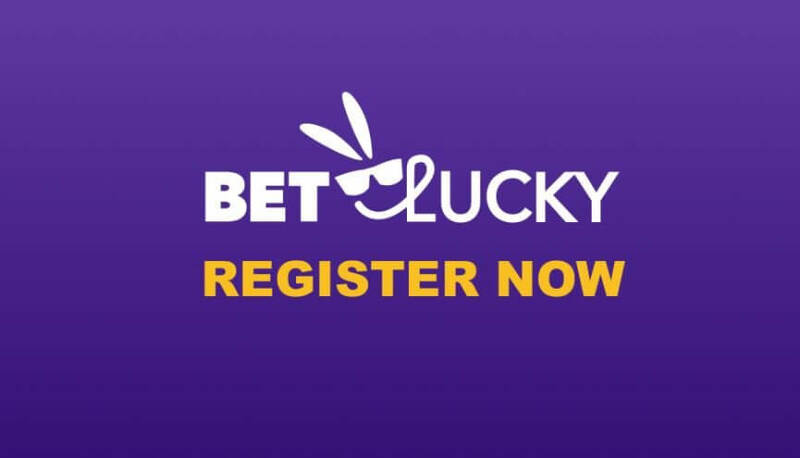 There is also in-game betting supported for exciting betting action. Since sports betting in PA just became legal, the online version of the Parx Casino Sportsbook is still being developed, so you will only have limited access to betting options. The Parx Sportsbook is one of the few sports betting venues in PA. Even though it is a new sportsbook, you will find all types of opportunities to wager and win. There will be special offers as well, such as Parx free picks and insurance bonuses. You will also benefit from the Parx live stream of current games and events. The Parx Casino Sportsbook will soon offer more features and bonuses. With many betting options, the Parx Casino Sportsbook provides you with every possible way to bet. There are money lines, totals, spread bets, proposition bets, teasers, and more. The Parx live stream offers a great way to watch all current events and games. Another popular form of sports betting in PA is horse racing. At Parx Casino, you can enjoy live races from Saturday through Tuesday. Live bets can be placed at the venue or you can place wagers via phone. Horse racing is not part of the Parx Casino Sportsbook. This Parx Sportsbook review revealed limited bonus opportunities. At this time, there are no Parx Sportsbook bonuses and only virtual bonuses for the online casino. Unfortunately, you will not find real money bonuses or promotions at this time. However, there are virtual credits that can be earned when creating an online account. As real money gambling is added to the online platform, you will find more bonuses being presented. There will also be great Parx sportsbook bonuses once the online site is complete. Here, you will enjoy Parx free picks, match bonuses, special event bonuses, and more. The mobile app that will be released later in 2019 will also provide ways to redeem promotional offers. At the time of this Parx Casino Sportsbook review, there is no online or mobile real money platform being offered. There is a free casino option where you can play some free games online. The Parx Casino Sportsbook just went live, so an online version will be following shortly. You can also expect a mobile version of the Parx Casino Sportsbook in 2019. In the meantime, sports bettors can download Parx’s Betslip Builder app to plan their bets before visiting Parx Sportsbook in person. This can be downloaded from the main online site and is available for Android and iOS users. Get the iOS app here or visit Parx Casino Sportsbook's website for Android. When accessing the online Parx site, you will find you will have trusted banking options. The Parx Casino Sportsbook online is not available at this time, but in the future, the site will offer popular methods of payment. The majority of the supported payment methods will also be able to be used to withdraw from a Parx Casino Sportsbook account. This will allow you to use various methods to receive winnings from Parx sports betting activities, including funds won from Parx free picks. Customer service will be offered at the Parx Casino Sportsbook online. At the time of the Parx Sportsbook review, there are multiple contact methods supported. This includes email for the online casino and phone or email for the land venue. Likewise, the online site also offers an FAQ page with useful answers to common questions. Based on Parx Sportsbook reviews, the customer support team is highly responsive and offer fast and friendly service. When the Parx Casino Sportsbook offers real money betting online, you can expect phone and live chat support to be offered. This will provide you with access to professional support as you engage in sports betting in PA.
With Parx sports betting now offered, you can enjoy Parx live stream coverage as well as many betting options. As soon as the online version is available, there will most likely be some great bonus offers, which may include Parx free picks and deposit bonuses. Overall, the Parx Casino Sportsbook will cater to sports betting enthusiasts and offer a wide market coverage. The land sportsbook is already operating and provides Parx live streams at the venue. You can also enjoy the thousands of casino games and benefit from a free online casino platform for casual gaming. Unfortunately, at this time, there are no real-money Parx Casino Sportsbook bonuses being offered. If you're in Philly, don't forget to check out our review of SugarHouse Sportsbook & Casino.